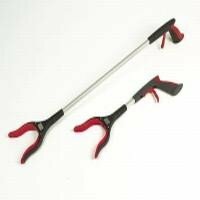 Ergonomic handle with grabber claws which can be adjusted through 180 degree maximum versatilty. Soft end tips of claw are ideal for picking up hazardous waste such as needles, sharps. glass etc, also ideal for removing debris or used screens from urinals or toilets.